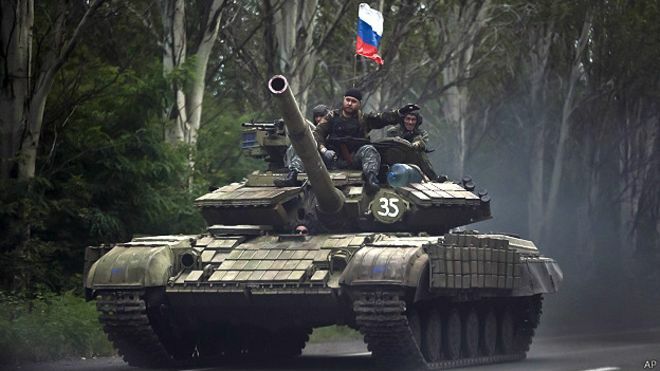 The OSCE and the Ukrainian side of the Joint Control and Coordination Centre (JCCC) reported a vastly growing number of armored vehicles - tanks, artillery and infantry fighting vehicles - in the areas of occupied territories, where there should be no military forces and vehicles kept, according to Minsk agreement provisions. The Joint Operation Forces HQ reported this on Facebook. 'Patrols and OSCE drones observe a considerable amount of heavy weaponry of the armed formations of the Russian Federation, which is planted in the breach of the withdrawal procedure, and the weaponry is not in storage areas', the message says. In various areas, such as Bugaivka, Shymshynivka, Kryshtaleve, Oleksandrivske, Ternove, Kruhlyk, Manuilivka and Myrne, OSCE patrols spotted dozens of tanks, howitzers, anti-tank cannons, heavy 120 mm mortars, IFVs and anti-aircraft missile launchers. The overall number of the weaponry and armored vehicles made 472; that is enough to deploy six battalion task groups, the report of the JCCC says.